Resorts World is a strange beast in the best possible sense. Part gambling mecca, part retail outlet centre, part leisure development, its location within the grounds of Genting Arena serves predominantly the throngs of people otherwise visiting the nearby exhibition halls. Initially I was sceptical; where was their core business, other than the constantly shifting demographics of those staying short term in a nearby hotel? I failed to see how they could constantly draw on more local support, when even the most local of those is a good taxi journey away. But what do I know. It transpires that their master plan is simple: To take the development and make certain parts of it more exclusive than what we already have anywhere else in the city. To offer the glitz of a five star hotel in bar and restaurant form with a suitable price tag. People are suckers for the glamorous and the expensive, few more than my fickle self. 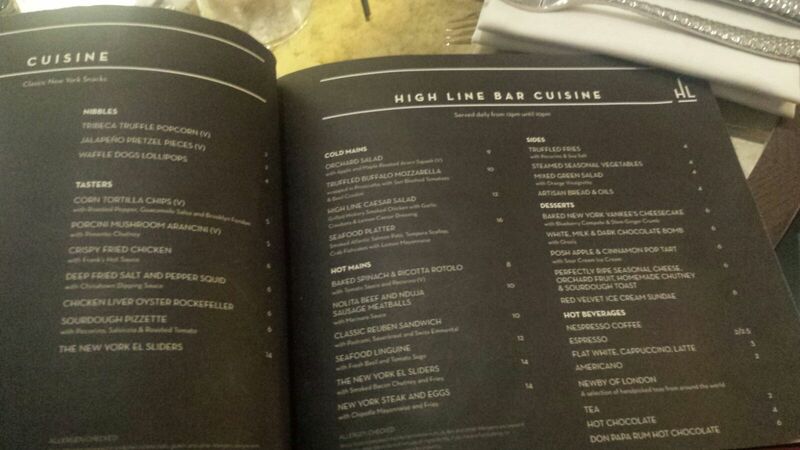 All of which brings me to The Highline, a chintzy new bar restaurant within the confides of the development. It’s a pretty art deco styled space, with deep turquoise booths and monochrome fittings that ooze Great Gatsby style 1920’s chic, a sentiment echoed by smartly turned out staff who look to have been employed as much on their aesthetics as their congeniality. The menu looks to New York for inspiration, with a strong Italian accent that you may find in the lower west side. We start with corndogs like those I had in New York less than six months ago. 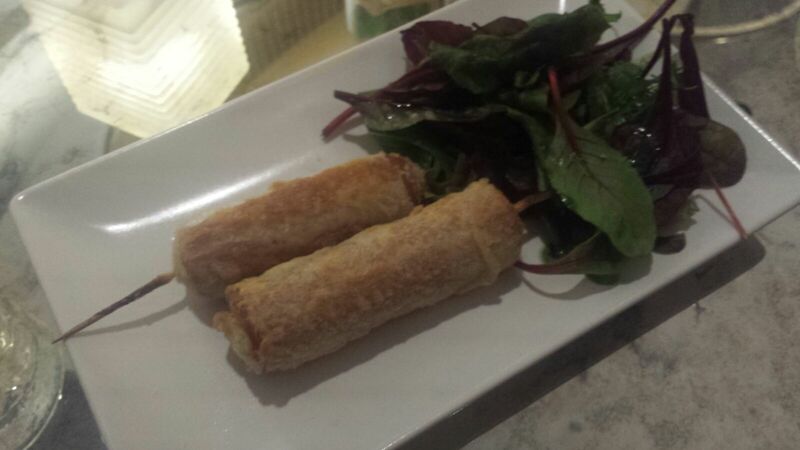 These are infinitely superior, the finely minced sausage inside a batter far lighter than it looks. 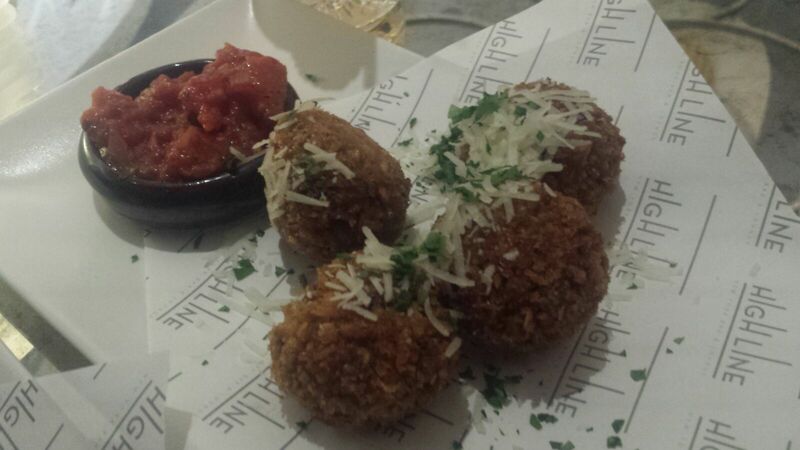 From there we take arancini balls that have a deep savoury flavour from plenty of porcini mushroom and properly jointed chicken wings which crack from their crisp batter. 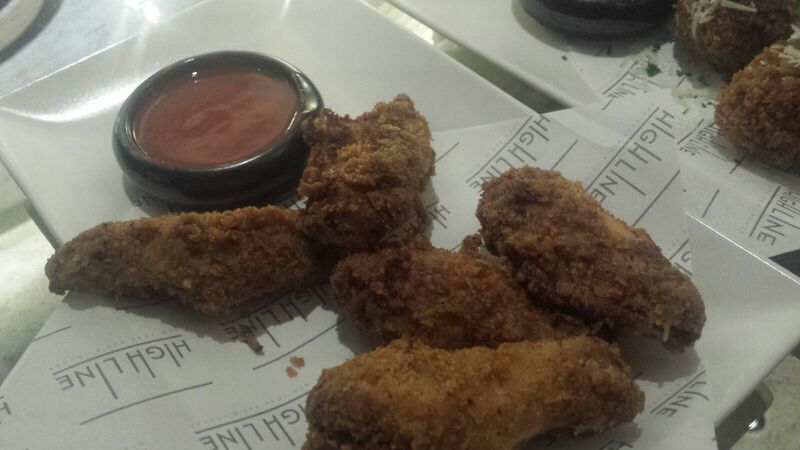 The ingredients are high quality and everything avoids the greasiness that too often plagues deep fried food. 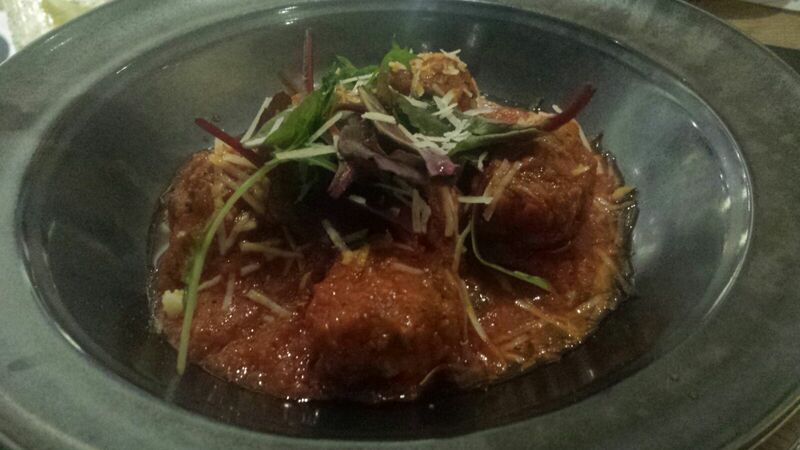 Meatballs are gutsy things of beef and spiced pork, sat in a thick puddle of tomato sauce that punches with plenty of garlic. The bread which I would have piled these on to needs work, though it matters little as I dredge excellent fries through the last of the sauce. 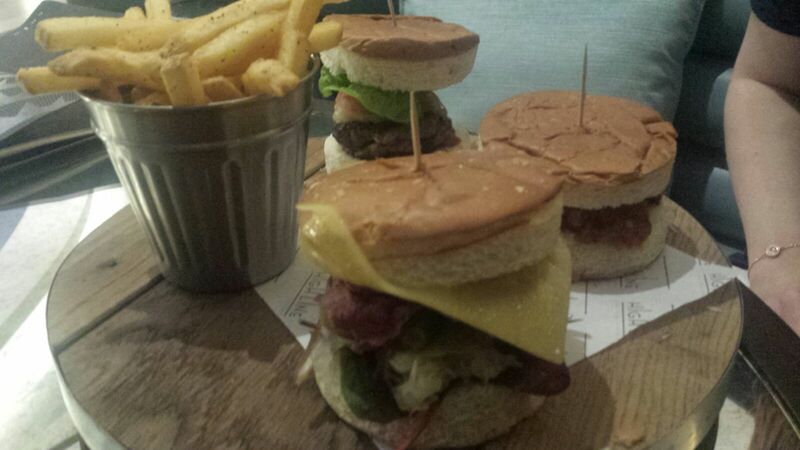 Sliders are too big to rightly be labelled as such – instead consider them as three sandwiches for £14.00, which would easily feed two. The Rueben is not quite there yet, whereas the beef burger very much is with a big whack of cow flavour offset by pickles with nice acidity. There is another with more of the meatballs which disappears quickly. Too full for dessert we order two desserts, purely in the name of research, of course. A pop tart is everything that McDonalds wishes its apple pie could have been, with flaky pastry and a filling of apple and cinnamon which leaves you wanting more, without the first degree burns. 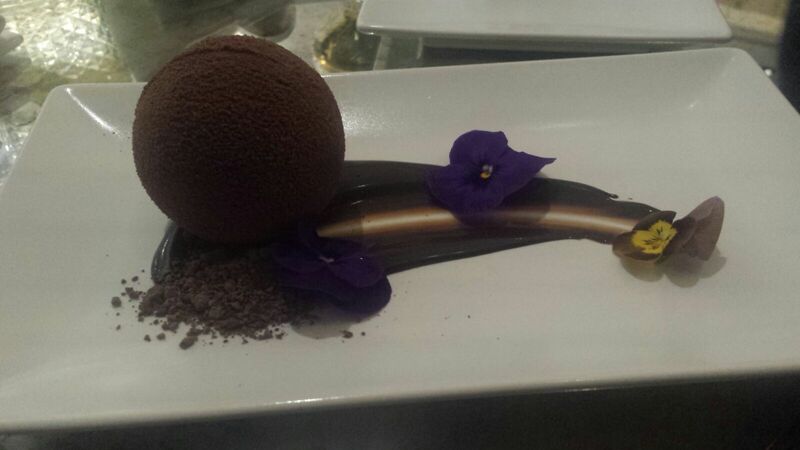 Best is a chocolate bomb, delicate in texture and big on flavour. 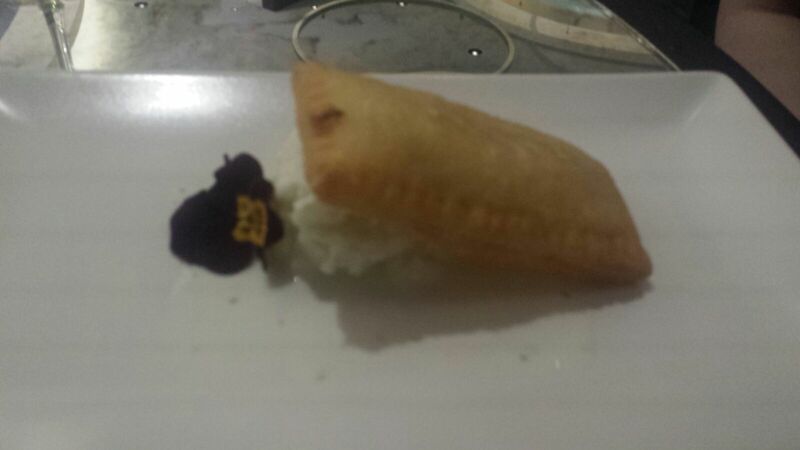 My advice is simple; come here for cocktails, order the meatballs and follow it up with this bomb for dessert. Thank me afterwards. Afterwards we go for a drink in The Sky Bar and very good they were, too. From our perched seats we could see a couple eating at the chefs table that looked a far more serious intention from what we ate. The taster menu they do is reason enough for a return, as would be Bottega, the prosecco bar with hunks of cured Italian meats. Resorts World already has its doubters, though we were impressed. It wears its ambition proudly on its sleeve. And that is perfectly fine with me.